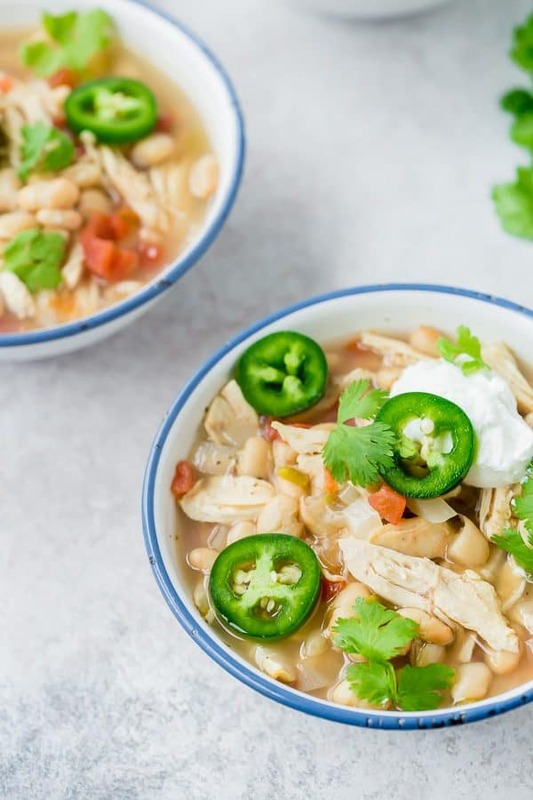 This slow cooker white chicken chili will become your go-to recipe for cool weather entertaining and busy weeknights. Included in the recipe are more than 5 ways to adapt this and make it perfect for YOU! I’m trying my hardest to roll with the punches, because after all, it’s my 34th year in Michigan this is not new behavior for our dear old mitten state. I do, however, refuse to wear my big puffy parka in April. I just won’t do it, I don’t even care how cold I am. The slow cooker can stick around, though. Truthfully, I love the slow cooker all year round. In the winter, it makes cozy soups and stews and in the summer, it makes meals without heating up the whole house. It works just fine in April winter, too. 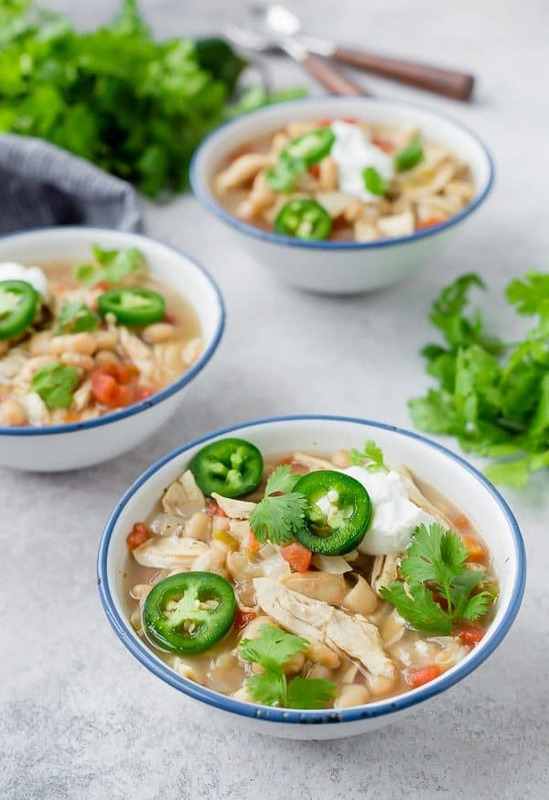 This slow cooker white chicken chili is one of my go-to recipes. As with most of my go-to recipes, I almost always have all the ingredients on hand, or some form of them that I can get fairly close to the recipe (we’ll discuss some adaptations you can make if your pantry isn’t stocked with these exact ingredients). I love making this chili for parties because it’s always a huge hit and people can dress it up with their own toppings. It’s a staple at our annual fall harvest party, but I make it nearly year-round. I’ve made it on the stovetop, in the Instant Pot, and in the slow cooker. Countless times in all of them. The crockpot version is as perfect for parties as it is for busy days. 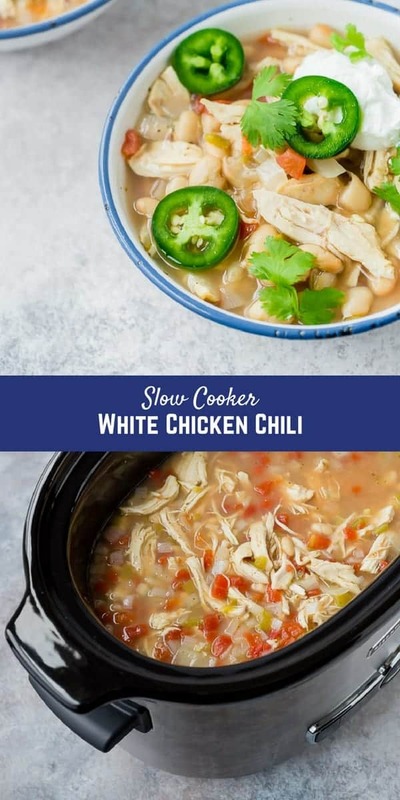 Throw all the ingredients in the slow cooker (it will take you five minutes, ten if you haven’t had your coffee yet), head out and when you come back, your house will smell amazing and dinner will pretty much be D-O-N-E.
I’ve made this slow cooker white chicken chili hundreds of times, and it’s always a little different but always so, so, so easy. Shared in the recipe card is the most common version and ideas to make it your own. There are ways to make it healthy (it’s quite healthy as is), and there are ways to richen it up a bit. We’ll talk…I have you covered. 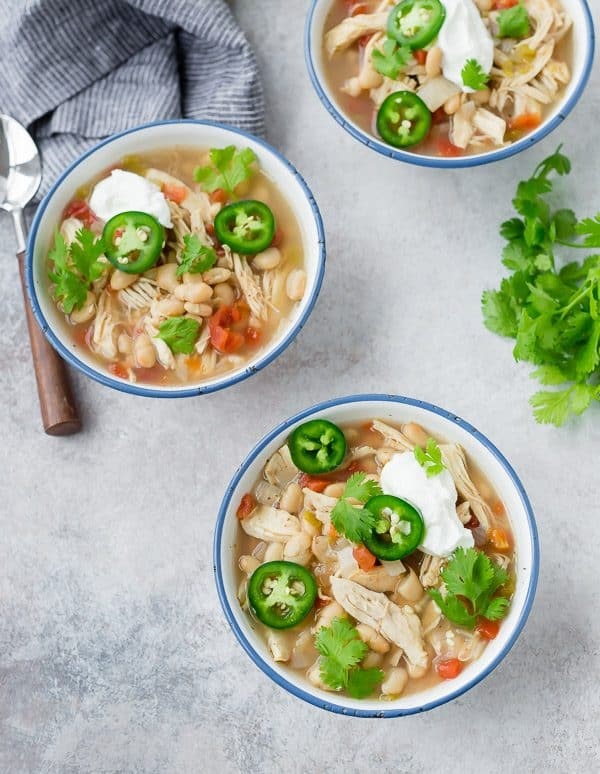 Make this Slow Cooker White Chicken Chili your own! Hey, are you doing a Whole30? Leave out the beans! If you want, you could replace them with some diced potatoes. Don’t like chicken breasts? Try it with thighs! When I’m making this for a party, I almost always stir in 1-2 cups of shredded (shred it yourself!) monterey jack cheese. It adds so much great flavor and it also thickens up the chili a little to make it more chili-like and less soup-like. Alternatively, you could keep the cheese on the side and use it as a garnish. Or leave it out completely (I left it out for the photographs). Want to use your Instant Pot? Cook on high pressure for 15 minutes before doing a quick release. Take out the chicken breasts, shred them, return them to the chili. Want to cook on the stove? I like to dice my chicken and sauté it first with the onions, before adding the rest of the ingredients and simmering until it’s deliciously cooked through and the flavors are perfect. Don’t have green chiles and/or tomatoes? I often throw in a jar of my favorite salsa instead of those two ingredients. It’s easy and the taste is fantastic. Want to bulk it up a little? I like to add a can of black beans for some color and flavor and also some corn! Fresh, frozen, or canned corn all work – I add them right before serving to prevent them from getting tough. Love cilantro? Instead of just sprinkling it on top, chop up a bunch and stir it right into the chili. Like it spicy? Try adding more green chilies, diced jalapeño, or red pepper flakes to turn up the heat. Want it extra extra creamy? Try stirring in 4 ounces of full-fat cream cheese when it’s done cooking. I love the flavor the cream cheese adds to this chili. 48 ounces of beans a little too beany for you? It’s cool, I get it. Go ahead and cut down on them! Try using two cans instead. Are you guys getting the point here? You can make this completely your own in about 100 different ways, but it’s also perfect as written on the recipe card. How are you going to try it first? 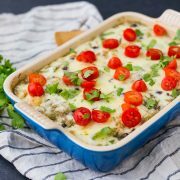 I topped mine with Greek yogurt, cilantro, and jalapeños. But I’ll be honest, because you guys are my friends. I picked the jalapeño off before I ate it…it just looked pretty in the photos but I’m a little wimpy when it comes to spicy stuff. 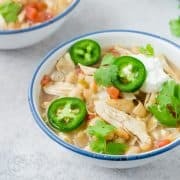 If you love slow cooker soup, you’ll also love Slow Cooker Green Enchilada Soup, Slow Cooker Tomato Basil Soup with Tortellini, and Slow Cooker Creamy Chicken and Rice Soup. 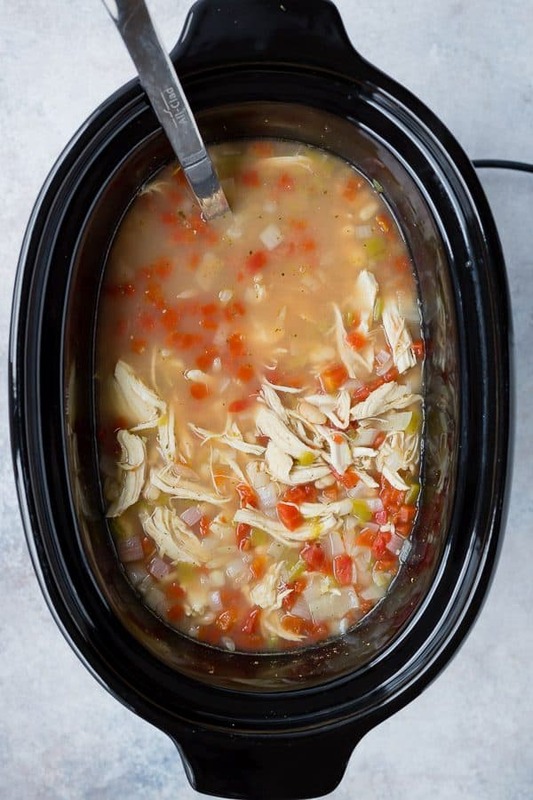 If spring continues to behave the way its been behaving, I’ll also be trying Pinch of Yum’s Slow Cooker Chicken Pot Pie Soup and Sweet Phi’s Healthy Slow Cooker Lentil and Vegetable Soup. optional toppings: tortilla chips/strips, jalapeño, avocado, cilantro, cheese, sour cream etc. 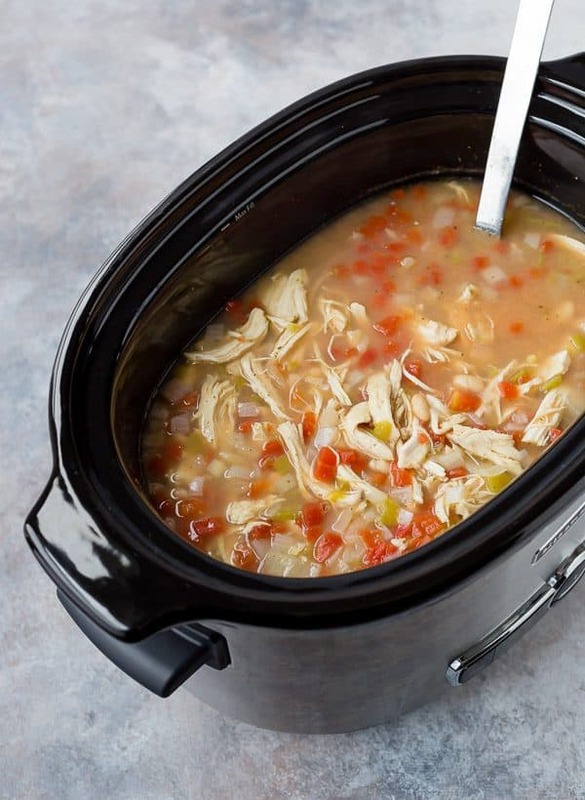 Add all ingredients to a 6-quart slow cooker. Stir to combine. Place lid on slow cooker and cook on high for 4-5 hours or low for 7-8 hours or until chicken is cooked through. 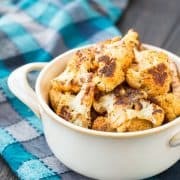 Remove chicken breasts to a plate and use two forks to shred it into bite-sized pieces. Return to slow cooker and cover and cook on low for 15-20 minutes more or until you’re ready to eat. Serve topped with your favorite toppings! If desired, substitute a jar of your favorite salsa for the tomatoes and green chiles. If you’d like this to serve a few more people, try adding in a can of drained and rinsed black beans and a can of drained canned corn. If you like it creamy, try melting in 4 ounces of cream cheese at the end, or melting 1-2 cups of shredded monterey jack cheese into the chili when it’s finished cooking. Instant Pot Directions: Cook on high pressure for 15 minutes before doing a quick release. Take out the chicken breasts, shred them, return them to the chili. 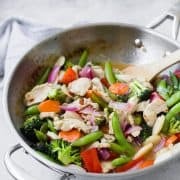 Stovetop Directions: Dice raw chicken and sauté with a tablespoon of oil and the onions, before adding the rest of the ingredients and simmering until it’s deliciously cooked through and the flavors are perfect. Verdict: Cozy, comforting and filling. Oh and easy to make? 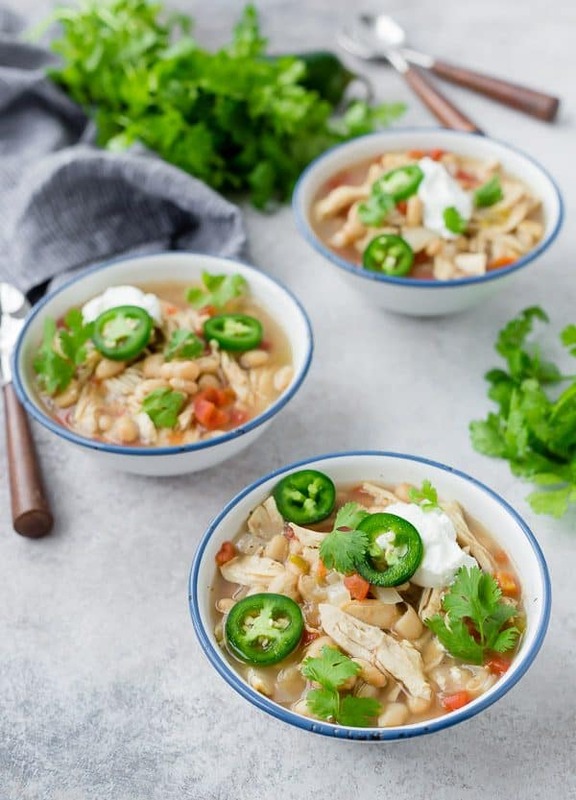 This slow cooker white chicken chili is always a win in my book. Husband’s take: Ben loves this recipe and is happy every time I make it. Changes I would make: As I mentioned once or twice or a million times, none are necessary at all, but there are a whole bunch of different ways you could go with this chili. I am craving a big bowl of this chili right now! Looks so delicious! Perfect! Thanks Ginger, let me know how you like it! Thanks for pinning!